The Creekside's rambling rooflines and combination of stacked stone, metal roof, wood siding and timber details recall the romance of the rugged mountain west. The partial, walk-out basement works with a sloped lot organically, following the natural lines of the land, while its footprint of 41 by 61 feet allows it to fit comfortably on a narrow site. PrecisionCraft Log & Timber Homes and Mountain Architects are proud to release their latest timber frame home plan, the Creekside. The home’s exterior mix of wood siding, stacked stone and corrugated metal roof sections recall the gold rush days, while its bright, open interior is a perfect fit for twenty-first century living. Intentionality of design and sensitivity to client needs are evident in the Creekside. Its generous living areas, home-office space and ample guest suite are all accommodated in 2,521 square feet, with another 636 square feet of patio and covered decks for outdoor living. The partial, walk-out basement works with a sloped lot organically, following the natural lines of the land, while its footprint of 41 by 61 feet allows it to fit comfortably on a narrow site. The Creekside features heavy timber trusses that soar above the great room, flanking the stone fireplace and enhancing the view from the room’s wall of windows. The seamless flow of the great room, kitchen and breakfast nook, along with direct access to the deck and patio, makes the Creekside an easy place to entertain, while the home’s more private wing offers a quiet retreat for work or rest. Downstairs, the walkout provides a spacious guest suite complete with its own entrance. Mountain Architects’ Matt Franklin, who designed the Creekside, said special attention was given to the volume of rooms on the main level to give them a bright, airy feel. 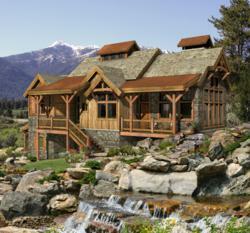 To see The Creekside timber frame home plan and browse a complete collection of Mountain Architects’ luxury log home plans, visit our Log Home Plans Gallery.